No Place Like Home Dr. Blake Chandler cherishes giving back to his hometown When Blake Chandler, MD, headed to medical school, he did so with the support of his family, friends and his hometown. Severe Asthma Disparities Study Finds Social Determinants Impact ED Usage Racial disparities between asthma prevalence, severity and morbidity have been well documented in numerous scholarly journals. A recently published article in the Journal of Allergy and Clinical Immunology (JACI) drilled down on emergency department utilization between self-reported black and white patients, ﬁnding that while self-reported black patients were more than twice as likely to visit an Emergency Department, those disparities disappeared when factoring out social determinants and related environmental exposures. Phyllis Blount remembers when her elderly mother was in the emergency room after a fall. Blount didn’t call Dr. Vincent Smith, her mother’s primary doctor, but he showed up anyway to check on her. On a Saturday. Mary Jehl Kenner recalls a time 25 years ago when she sat for three hours in a waiting room with her daughter to see an eye doctor. Kenner, a single mother, who took off work for the appointment, complained to the doctor. “Make an earlier appointment next time,” he said. There was no next time. Kenner never went back. It still makes her mad, 25 years later. Sometimes patients leave for reasons beyond a medical practice’s control, such as a change in health insurance coverage, the patient moves away, or their doctor is leaving or retiring from the practice. But there are plenty of proactive patient retention steps in a practice’s control that can keep their patients happy and connected. Most medical practices use technology, training, social media and old-fashioned attention to patients as part of proactive patient retention. The practices contact their patients through texts and emails. Patients can log into their patient portals to see test results and summaries of their office visits. 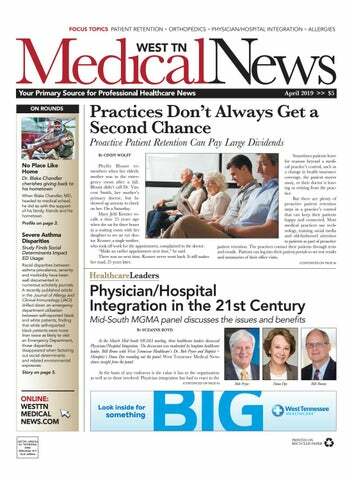 At the March Mid-South MGMA meeting, three healthcare leaders discussed Physician/Hospital Integration. The discussion was moderated by longtime healthcare leader, Bill Breen with West Tennessee Healthcare’s Dr. Bob Pryor and Baptist – Memphis’s Dana Dye rounding out the panel. West Tennessee Medical News shares insight from the panel. We’re the biggest name in babies. And healthcare. Every year, we deliver over 4,000 bundles of joy. In fact, if you’re from anywhere in West Tennessee, odds are, we’ve been taking care of you since day one. And with comprehensive healthcare serving over half a million people, we’re the name our region trusts. The Care You Trust, Right Here. An avid hunter and fisherman, Dr. Blake Chandler shows off one of his catches while on a fishing excursion in Alaska. It costs your hospital or practice about five times more to obtain a new patient than to keep an existing patient within your database. That’s why patient retention matters –the overall loss of a patient’s lifetime value is not something you want to give up. So if you’re losing patients, you might be . . . well . . . losing patience. The good news is there’s something that can be done to fight the trend. However, you must be willing and able to audit your current processes and find out what’s turning patients away, and be honest about why they might be seeking help elsewhere. About the Writer Stewart Gandolf is CEO and creative director of Healthcare Success. He has marketed and consulted with more than 1,400 healthcare clients, ranging from private practices to multi-billion dollar corporations. Additionally, he has marketed a variety of America’s leading companies, including Citicorp, J. Walter Thompson, Grubb & Ellis, Bally Total Fitness, Wells Fargo and Chase Manhattan. Gandolf cofounded Healthcare Success. In addition to writing about healthcare marketing he is also a noted speaker on the subject. hold for 10 minutes is no longer acceptable practice. It’s a reflection of how you treat patients in the office, and some people will simply hang up if a hold is unexpected. • Confusion or misinformation. There are some questions your front office staff simply cannot answer, whether due to doctor-patient confidentiality or because a question required medical advice. However, your front office should be able to redirect the question properly and make sure patients feel able to get the answers they need. • Billing issues or inefficiencies. If a patient is overcharged, for example, or given misinformation about insurance coverage, they have plenty of reason to go elsewhere. patients are waiting even longer than this—and that’s a long time to go without anything happening to you (not to mention time spent waiting for testing, etc.). About 30 percent of patients say they have left a doctor’s appointment because of a particularly long wait. Many practices in your area are actively taking steps to reduce wait times. Patients will find somewhere else to go if the problem is not addressed. ply sending out appointment reminders. The little gestures mean a lot, from calling to check up on how well a medication is working to asking whether a child is feeling better. Patients will remember that you took the time to ask. A big part of maintaining a patient relationship also involves marketing. Build your brand through social media or use automated email campaigns to update previous patients so that they come back to your practice or hospital or recommend you to friends. One bad experience can ruin your chances of patient loyalty. There are some experiences you can’t bounce back from if a patient resolves never to return to your office. However, you may be able to learn from those patient experiences to prevent this from happening in the future. Think of a time you’ve had a bad experience that kept you from going back to a restaurant or retail store. Maybe you ranted about the experience to friends who had a similar complaint. Or maybe you went online to find that lots of people had left reviews of a similar nature. When patient retention is low, you may be able to attribute it to a shared experience driving people away from your practice or hospital. Check your online reviews to find out what people are saying about your practice. Better yet, automate reviews so that you can easily review feedback and respond if need be. Part of marketing any healthcare organization means being willing to change your processes to keep up with what patients want. exposures to decreased access to resources – factored into a patient’s ultimate arrival at the ED for asthma treatment. Once inverse probability of treatment weighting was used to balance for these variables, Fitzpatrick said the difference in ED usage ceased to be statistically significant. “I think the encouraging thing about our results is they are not pointing to genetics or biology,” Fitzpatrick continued. “That’s a good thing because we can design interventions,” she added of addressing the root causes of the disparities. She added that while ED usage was the primary outcome studied, secondary outcomes included use of inhaled corticosteroids, physician office visits for asthma and asthma-related hospitalizations. “Outpatient visits for asthma were much less in black patients,” she said, adding the study found black patients were 43 percent less likely to see a physician or other provider for asthma care in the community. “It tells us our efforts toward outpatient management of asthma are not sufficient.” Noting the black patients in the study tended to be more economically disadvantaged than the white participants, Fitzpatrick said social determinants loom large. “These medications for asthma are expensive, and there are very few generics,” she said. “These are real world problems,” Fitzpatrick continued of trying to decide between using limited resources to care for your children or purchase your inhaler. She noted the nature of asthma also adds to the problem. “Asthma is one of those diseases where some days you feel really good, so you skip your medicine. It’s like a perfect storm,” she continued. “You feel okay, but inflammation is actually building up.” The SARP findings have opened the door to many more questions. Does more time need to be spent on health literacy and disease education? Can access to care and affordability of medicines be improved? Is there a cultural mistrust of the health system? What are the best ways to reach the target audience for improved outpatient management? What steps should be taken to address environmental factors? This initial ED usage report came from the first year of observation of 579 participants ages six and older. Follow-up reporting from SARP investigators will continue over the next few years. While this new report doesn’t offer specific solutions to the larger issue of disparities, Fitzpatrick said it’s a first step to further study. Knowing the role of social determinants on ED utilization allows other investigators, public health officials and policymaker to look for specific interventions to address the non-biological factors exacerbating severe asthma. “It’s good because we can do something about it,” she concluded. PUBLISHER Pamela Z. Haskins pamela@memphismedicalnews.com EDITOR Pepper Jeter editor@westtnmedicalnews.com CREATIVE DIRECTOR Susan Graham sgraham@nashvillemedicalnews.com GRAPHIC DESIGNERS Susan Graham Katy Barrett-Alley CONTRIBUTING WRITERS Suzanne Boyd, Stewart Gandolf Cindy Sanders, Cindy Wolff All editorial submissions and press releases should be sent to pamela@memphismedicalnews.com Subscription requests can be mailed to the address below or emailed to pamela@memphismedicalnews.com. West TN Medical News is now privately and locally owned by Ziggy Productions, LLC. P O Box 1842 Memphis, TN 38101- 1842 President: Pamela Z. Haskins Vice President: Patrick Rains Reproduction in whole or in part without written permission is prohibited. West TN Medical News will assume no responsibility for unsolicited materials. 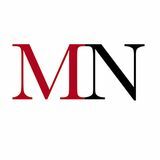 All letters sent to West TN Medical News will be considered the newspaper’s property and unconditionally assigned to West TN Medical News for publication and copyright purposes. JACKSON - West Tennessee Healthcare is pleased to announce a new collaboration between its multispecialty medical clinic, West Tennessee Medical Group, and Hinds Medical Clinic. The clinic, which includes 2 providers, is located at 215 Hawks Rd., in Martin, Tennessee. The providers practicing in the clinic will be Michael Hinds, MD, and Amiee Stooksberry, NP. Farrah Vernon, DO has also joined the practice. The acquisition was effective March 18, 2019, however, patients of Hinds Medical Clinic will likely see no change with the transition. Patients of Hinds Medical Clinic will continue to see their same provider at their same location said Darrell King, vice president, West Tennessee Medical Group. The new collaboration will enhance the existing primary care services provided by Hinds Medical Clinic by creating access to the vast array of innovative resources offered through the West Tennessee Healthcare system. Office hours of the clinic are Monday through Friday, 8:00am to 5:00pm. For appointments, please call 731-5873454.
pensation for the 11 faculty physicians in the program and residency program and administrative support staff. The health system will be the owner and operator of the clinic. This agreement strengthens the long-standing and successful relationship with Jackson-Madison County General Hospital, benefits the academic and clinical mission of the university, and ensures continued excellent delivery of family medicine services to the people of Jackson and the surrounding area. rison Smith, and David Villareal, are all board-certified and will continue to provide services at 395 Hospital Blvd in Jackson. West Tennessee Healthcare and Jackson Surgical Associates have been working collaboratively for many years according to Darrell King, Vice-President, West Tennessee Medical Group. Office hours of the clinic are Monday through Friday, 8:00am to 5:00 pm. Our team of over 130 Medical Providers coordinate care in over 25 medical specialties and sub-specialties.